Taking a chance with someone who wasn't yet his client, Skip Phillips sketched up an alternative to a proposed pool renovation and ended up completely transforming a large backyard space. It was suddenly a major project -- and then came a long list of efficiency-oriented details! I’ve noticed through the years that, from my perspective at least, some of my favorite projects come with the best stories. The poolscape seen here is definitely one of these. The client started things off by purchasing a house in an ultra-high-end neighborhood, then personalized it with all sorts of details, materials and finishes that turned the existing house into an extremely comfortable Country French-style estate. The one element it lacked, he figured, was a nice swimming pool. While he was considering his options, the home next door – one with a pool already in its backyard – came on the market. He bought the whole thing, knocked down the wall and proceeded to harmonize new and old by remaking the second house as another Country French villa. As this work moved along, he called in his architect and landscape architect and had them look at the pool with an eye to revisions that would make it fit within the overall program. They came up with some ideas and called me in for a meeting with the client to offer advice on feasibility and costs. Their plan, they said, was to raise the wall on the back/far side of the pool to give it more visual weight – and also add some jets and sprays for good measure. After I had a look around, I suggested that there were a few issues: First, the pool was the wrong size, the wrong shape and in the wrong place. Second, without pulling things apart, there was no way of knowing whether the shell could withstand the several-ton surcharge the raised wall would impose. This wasn’t what any of them expected to hear, of course, but the client recovered first and asked me what I’d do instead. I pulled out my notebook and started in with my pencil. Within maybe 30 seconds, I showed them all a sketch that would’ve made anyone who had ever tried to teach me to draw feel queasy. But it made my point, and the client wanted to know more. Much more. As I had learned, he was quite wealthy but hadn’t gotten there by being impulsive. He started peppering me with questions about what it would cost to remodel the existing pool compared to the cost of removal and replacement. He also wanted to know everything he could about my concept and kept pushing for more and more detail – which resulted in another set of hasty-but-expressive sketches. I figured I had nothing at stake, so I started explaining basic costs and noticed pretty quickly that he wasn’t entirely at ease with the obvious imbalances. Unaffected by that discomfort, I pointed out that a pool such as this one really should have an all-tile interior and some other nice details that would add considerably to the cost. Next, I asked if he had young kids and, hearing him answer in the positive, said the pool should have a solid, retractable cover – something that came up from the floor so it would in no way interfere with the perimeter-overflow and vanishing-edge details we’d been discussing. The remodeled home was beautiful and clearly deserved more than a patch-up job on a pool that was in the wrong place with the wrong size and shape (not to mention its inappropriate decking). I started things rolling with a quick sketch – not exactly polished, but enough to provoke a dramatic change in the clients’ direction. By the time I finished, the cost differential between the original remodeling proposal and my remove-and-replace concept had gotten quite dramatic – but it was obvious that there was something about my idea that had engaged him. And all through this process, his wife had been there, too, her crossed-armed demeanor suggesting that she mainly wanted to be somewhere else. So I agreed to tackle the design work and offered recommendations on two local builders who would be up to such an exacting job. Once the documentation was ready, the clients hired Bruce and Jeff Dunn of Mission Pools (Escondido, Calif.) to complete the project. At the time this project came along, I was still running Questar Pools & Spas (Escondido), but I’ve since sold that business and am now doing design work in association with its new owner, Bart Jacobs of La Jolla Pools (San Diego, Calif.). I’ve learned a lot during my long career and attribute the best of that education to time spent with Genesis, a group of designers, engineers and builders who work with water as an artistic medium. Although I was one of the group’s founders, I have also always been one of its most avid students – and what I’ve picked up about art, architecture, history and design strategy through the years is what’s put me in the position where getting involved with this ambitious sort of project is refreshingly common. I bring this up because of something the client said to me after the project was completed: I’d stopped by to have a look and give him a congratulatory bottle of wine, and he said, “You were the only one involved with this who offered me anything that went beyond what I’d already considered.” Without years of internalizing information from people who know more than I do, I never would have been in a position to get that sort of endorsement. As the design advanced, new features were added to the program, including an automatic pool cover that would rise from the floor as well as shell insulation and a system of radiant-heating hoses – all meant to help keep the water reliably and efficiently warm. When the shell was ready, the interior was covered in glass tile and stepping pads were made to ‘float’ on the surface. The number-cruncher did his work, and the client wanted to do better. So instead of shooting concrete up against heat-sapping soil, we wound up insulating the shell and including a radiant-heating system within its walls and floor. Yes, this all added to the project cost, but he knew from his actuary that the cover, insulation and heating systems would all pay for themselves in about four years. As it all came together for him, he left any doubts behind. 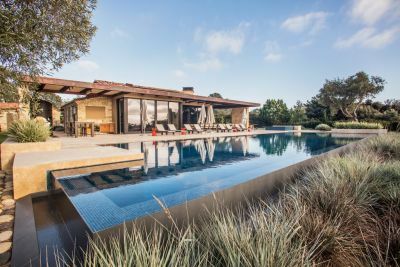 As for the design itself, the rectangular pool features a Lautner perimeter-overflow edge on the side of the pool near the house, with a shallow vanishing-edge detail on the far side that makes the water seem to flow into the landscape beyond. These manipulations of water level enhanced our ability to make the stepping pads at one end of the pool appear to float on the surface. The decking includes unusually large pieces of Travertine, the dimensions of which determined the distance between the house and the Lautner edge. And the pool itself is significantly larger than the original pool had been – all in keeping with the scale and proportions of what had become a truly large estate through acquisition of the neighboring property. Scale is also the reason we set the spa up at some distance from the pool: There was so much room available that it worked better visually to spread things out and separate the two prominent watershapes. The great thing about the owner’s choice of Mission Pools is that I really didn’t have to worry that the pool and spa would be done to specification. They did a fantastic job, end to end: The hydraulic systems work flawlessly, the edge tolerances are dead on target, the materials and finishes were beautifully applied and the decking is just fantastic. But it’s the hydraulic performance that brings this great story to a close: After Mission Pools completed its work, a German watershaper with whom I’d become friendly through Genesis classes we’d taught in Europe came to visit. I was to be out of town at the time, so I’d asked a designer friend of mine – Kate Wiseman, a Genesis instructor – to take him to see, in addition to some others, the just-completed project discussed above. Several months later, we were doing another class in Germany, and he was there. We reached a point in our presentation where we talked about reflective values and how important it is to minimize turbulence. He jumped up and started addressing the class in German, at which point someone handed me headphones so I could hear a translation. You have to like a project where one story is about swaying the thought processes of a sophisticated, opinionated client, but you have to love it when a second is about changing the direction of an entire skeptical industry in another country. One great project, two fine stories. Skip Phillips was president of Questar Pools, a high-end swimming pool design/build firm based in Escondido, Calif. – a business entity he recently sold to Bart Jacobs of La Jolla Pools of San Diego, Calif., for which he now works as a consulting designer. He started his business in 1975 as a service/supply/repair operation, moving quickly into renovations and new construction. Since then, he has won more than 100 local, national and international design awards, many featuring vanishing-edge designs. Phillips is a past president of the National Spa & Pool Institute, is a cofounder of Genesis, the educational group for watershape designers and builders, and sits on the board of directors of the National Swimming Pool Foundation.